By Todd Abelson NMLS #180858 on August 10, 2010 . Today, in its first meeting in 6 weeks, the Federal Open Market Committee voted 9-to-1 to leave the Fed Funds Rate unchanged. The Fed Fund Rate remains at a historical low, within a prescribed target range of 0.000-0.250 percent. In its press release, the FOMC said that, since June, the pace of economic recovery “has slowed”. Household spending is increasing but remains restrained because of high levels of unemployment, falling home values, and restrictive credit. Today’s statement shows less economic optimism as compared to the prior year’s worth of FOMC statements dating back to June 2009. The Fed is looking for growth to be “more modest in the near-term” than its previous expectations. There were no surprises in the Fed’s statement so, as a result, the mortgage market’s reaction to the release has been neutral. Mortgage rates in Arizona are unchanged this afternoon. The FOMC’s next meeting is scheduled for September 21, 2010. By Todd Abelson NMLS #180858 on February 9, 2010 . The economy’s improving but lending standards are not. Nationally, banks are making mortgage approvals harder to come by. 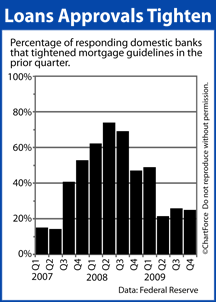 The data comes from the Federal Reserve’s quarterly survey to its member banks. The Fed asks senior bank loan officers around the country to report on “prime” residential mortgage guidelines over the most recent 3 months and whether they’ve tightened. Just 2 of 53 banks said its guidelines had loosened. Combine the Fed’s survey with recent underwriting updates from the FHA and generally tougher standards for conventional loans and it’s clear that lenders are much more cautious about their loans than they were, say, in 2007. So, if you’re on the fence about whether now is a good time to buy a home, or make that refi, consider acting sooner rather than later. It doesn’t necessarily matter that mortgage rates are low, or that there’s an up-to-$8,000 home purchase tax credit for households that qualify. With each passing quarter, fewer and fewer applicants are eligible to take advantage. By Todd Abelson NMLS #180858 on February 5, 2010 . As mortgage lenders tighten approval standards in Arizona and nationwide, the importance of a good credit score is rising. Credit scores not only make the difference between a mortgage approval and mortgage turn-down, but they also play a large role in determining your actual mortgage note rate. In general, a 740 FICO will insulate a borrower from the higher costs and/or rates associated with low credit scores. Below 740, though, every 20 points adds to the damage. Watch the video and apply what you can to your own situation. The more you know, the more you can save. By Todd Abelson NMLS #180858 on January 27, 2010 . The Federal Open Market Committee voted to leave the Fed Funds Rate within its target range of 0.000-0.250 percent. In its press release, the FOMC noted that the U.S. economy “has continued to strengthen”, that the jobs markets is getting better, and that financial markets are supportive of growth. There was no mention of the housing market’s strength. 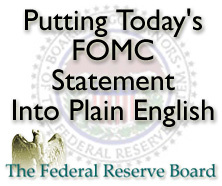 The last 3 statements from the Fed included that specific verbiage. It’s the fifth straight statement in which the Fed spoke about the economy with optimism. This should signal to markets that 2008-2009 recession is over and that economic growth is returning to U.S. economy. The message’s overall tone, however, remained positive and inflation appears is still within tolerance. Also in its statement, the Fed confirmed its plan to hold the Fed Funds Rate near zero percent “for an extended period” and to wind down its $1.25 trillion commitment to the mortgage market by March 31, 2010. This is noteworthy because Fed insiders estimate that the bond-buying program suppressed mortgage rates by 1 percent through 2009. Mortgage market reaction to the Fed press release is, in general, negative. Mortgage rates in Tucson are rising this afternoon. The FOMC’s next scheduled meeting is March 16, 2010. By Todd Abelson NMLS #180858 on January 22, 2010 . A “Housing Start” is a privately-owned home on which construction has started. It’s an important gauge of housing health because it tracks new housing stock nationwide. 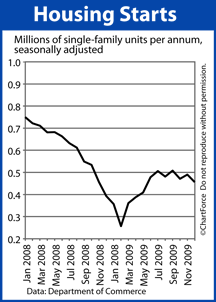 In December 2009, starts fell by nearly 7 percent. The news is mildly disappointing but not too bad. The likely cause for the Housing Starts drop is December’s rough weather conditions. It’s tough to break ground when Mother Nature won’t coordinate and last month was especially hazardous in a lot of parts of the country. More cheery, however, is that for the second straight month, Housing Permits exploded. A housing permit is an certification from local government that authorizes construction. After posting a 7 percent gain in November, permits rose by another 8 percent in December. It’s a signal that housing is, indeed, in recovery — despite the falling number of actual starts. More permits mean that builders plan to bring more homes on the market for what’s expected to be a very busy spring home-shopping season. According to the Census Bureau, 82% of homes start construction within 60 days of permit-issuance. Therefore, Housing Starts should start rising soon anyway. For home buyers, the news couldn’t be better. With more homes coming online, competition among home sellers should increase, and that will suppress the rise in home prices in Tucson and nationwide. It’s basic economics. When home supplies grow faster than home demand, prices fall. By Todd Abelson NMLS #180858 on January 20, 2010 . 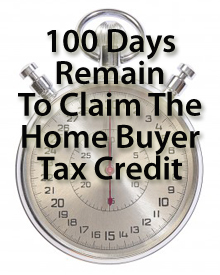 November 6, 2009, Congress voted to extend and expand the First-Time Home Buyer Tax Credit program. There’s 100 days left to claim it. The expiration date of the up-to-$8,000 tax credit has been pushed forward to spring, requiring homebuyers in Tucson to be under contract for a home no later than April 30, 2010, and to be closed no later than June 30, 2010. In addition, “move-up” buyers were also added to the program’s eligibility list meaning you don’t have to be a first-time home buyer to be eligible for the tax credit. If you’ve lived in your home for 5 of the last 8 years, you meet the IRS requirements. Move-up buyers are capped at a total tax credit of $6,500. The new law includes some notable updates, however. First, the subject property’s sales price may not exceed $800,000. Homes sold for more than $800,000 are ineligible. And, also, household income thresholds have been raised to $125,000 for single-filers and $225,500 for joint-filers. And lastly, don’t forget that the program is a true tax credit — not a deduction. This means that a tax filer who’s eligible for the full $8,00 credit and whose “normal” tax liability totals $5,000 would receive a $3,000 refund from the U.S. Treasury at tax time. The complete list of qualifying criteria is posted on the IRS website. Review it with a tax professional to determine your eligibility. Then mark your calendar for April 30, 2010. There’s just 100 days to go. By Todd Abelson NMLS #180858 on January 19, 2010 . Mortgage markets showed little conviction last week, carving out just a narrow trading channel. There was very little data on which for markets to move, leaving mortgage rates momentum-bound. Luckily for rate shoppers, mortgage rate momentum was favorable. Rates were slightly lower Monday through Thursday before breaking downward Friday afternoon. Home shoppers in Tucson this past weekend caught a nice break. Last week marked the second straight week in which mortgage rates fell. This week, in holiday-shortened trading and with little economic data set for release, expect mortgage rates to again move on momentum. The biggest report of the week is Wednesday’s Producer Price Index. 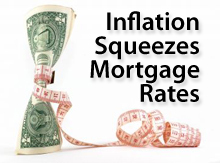 Producer Price Index is important to mortgage rates because of its role in inflation. PPI is akin to a Cost of Living-type measurement, but for business. As business costs rise, the thought goes, it’s not long before consumer costs rise, too. Businesses eventually pass on costs, after all. In this manner, a rising Producer Price Index can foreshadow rising consumer prices, and, therefore, inflation. Inflation is awful for mortgage rates. PPI expectations have revised downward this month, especially because last week’s data showed a deceleration in consumer prices nationwide. If PPI isn’t as weak as expected, mortgage rates will rise. Other influential data this week includes Housing Starts, Consumer Confidence and Initial Jobless Claims. So far, 2010 has been for mortgage rates in Arizona and around the country. If you’re in need of a rate lock, this week may be a good time to take one. By Todd Abelson NMLS #180858 on January 15, 2010 . Like real estate, it appears that foreclosure activity is a local phenomenon, too. 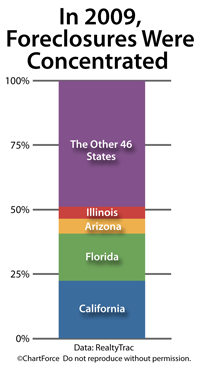 More than 1.4 million filings made in 2009 are attributed to the above states. Furthermore, each ranks in the Top 10 for 2009 Foreclosures Per Capita. The other states are Nevada, Utah, Georgia, Idaho, Michigan and Colorado. Versus 2008, foreclosures are up 21 percent nationwide and that’s a big number, but a deeper look at RealtyTrac’s annual reports reveals a more positive undertone on the housing market. Foreclosures are still prevalent, though, and buying homes in foreclosure in Tucson continues to be big business. First-time buyers, move-up buyers, and real estate investors each are bidding aggressively. Distressed homes account for one-third of home resale activity, according to an industry trade group. That said, buying foreclosures can be tricky. First, properties are often sold “as-is” and the cost of repairs may unwind the home’s status as a “value buy”. Furthermore, a lender may require specific fixes to be made prior to closing and that, too, costs money. Second, buying a foreclosed home in Arizona isn’t as streamlined as buying a “normal” home. Closing on a foreclosure can be a 120-day process or longer. A 4-month time-frame may not fit your schedule. And, third, finding foreclosures can be difficult. Despite the growth in foreclosure search engines, it still takes a good real estate agent to uncover the best homes at the best prices. Read the complete foreclosure report and take a peek at RealtyTrac’s foreclosure heat maps. If you like what you see, talk to your real estate agent about what to do next. By Todd Abelson NMLS #180858 on January 14, 2010 . Mortgage rates are dropping this morning on weaker-than-expected Retail Sales data from December. Lower rates means more bang for your home-buying buck. 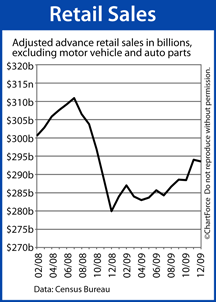 Excluding motor vehicles and parts, December’s “ex-auto” sales receipts were down roughly $500 million from November. Analysts had expected receipts to grow. The relevance of Retail Sales to home affordability isn’t obvious, but it’s definitely logical. Retail Sales is directly related to consumer spending and consumer spending accounts for the majority of the U.S. economy. When consumer spending slows, the economy often does, too. It leads investors to seek out “safe” investments. It’s the reason why stock markets often drop on weak economic data — stocks are among the riskiest investment classes available. Conversely, the best place to find safety is in the market of government-backed bonds. This world includes products like U.S. Treasuries and many of the mortgage-backed bonds that help set mortgage rates for people in Tucson. Weak economic data puts mortgage bonds in demand. For rate shopper, this is good news. More demand for mortgage bonds causes mortgage rates to fall. Mortgage rates are lower this morning because Wall Street is shedding some risk. December’s Retail Sales report closes out a year of generally-weak data. 2009 marks just the second time that Retail Sales fell year-over-year since the government started tracking it 40 years ago. The other year was 2008. For home buyers in Tucson and around the country, though, today may represent an opportune time to lock a mortgage rate. Housing data is still improving and other economic indicators are showing strength. Soon, Wall Street will shift from a “safe” mentality and move toward risk. When it does, mortgage rates will rise. By Todd Abelson NMLS #180858 on January 13, 2010 . As the housing market improves across the country, certain cities are emerging as relative bargains. Some areas, like Miami, were hit hard by the recession, and other areas are buoyed by good school systems and strong labor markets. In this 5-minute video from The Today Show, 10 cities are highlighted for their home prices. And they’re not “small towns”, either. Now, this piece is about finding gems on a national scale. They exist locally here in Tucson , too. You just need to know what to look for. With mortgage rates low and tax credits available, it’s not likely that bargains will last. Visit http://tucsonmortgage.wpengine.com to get pre-approved today. © Copyright Todd Abelson 2019. All rights reserved. Copyright violation prosecuted to the highest pentalty by law.